This is a reminder that an additional planting day has been scheduled for this Saturday, May 28th, starting at 10 am. Although much progress was made during the holiday weekend, there is still a bit more to do. Please join us if you can. If it is raining on Saturday morning, the planting day will be cancelled. This is a reminder that there is another planting day planned for this Saturday, May 21, starting at 10 a.m. The weather forecast is much better than last week, so hopefully, we can make up some lost time. We hope that those of you who are not leaving town for the long weekend will be able to join us in the garden. Since the weather prediction for the whole weekend is quite promising, there will be experienced volunteers in the garden on Sunday and Monday as well, after 11 a.m. 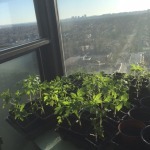 If you want to get out and enjoy the nice weather, join us to get some plants into the ground. Lastly, because we had to cancel last Saturday’s planting day due to the rain, we will have a third Saturday planting day on May 28th. This is also Doors Open day, in which John McKenzie House participates. It’s nice to have visitors see volunteers busy working in the garden. 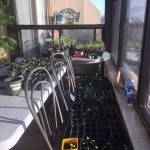 It promotes the garden, and often generates new volunteers and customers. We hope that you will be able to participate in one or more of these upcoming events. 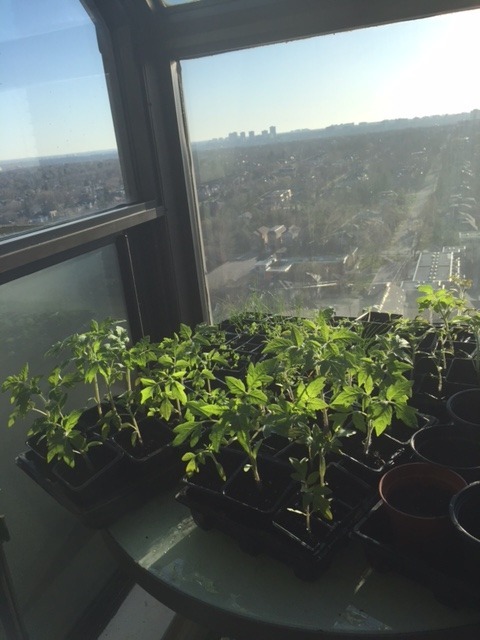 We have lots of seeds and seedlings to plant, and we need your help! 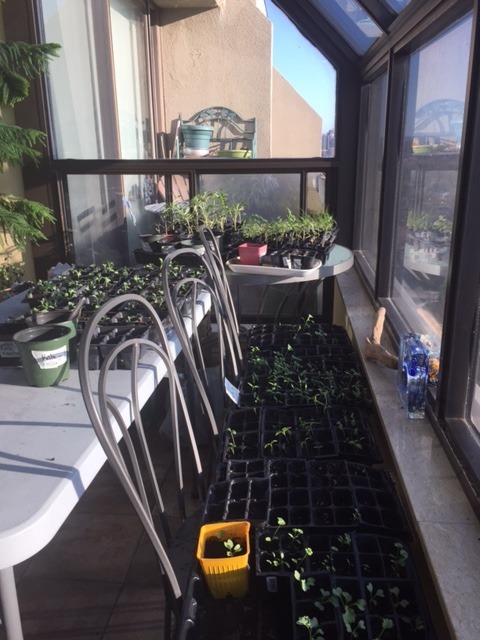 This is a reminder that the first of three planting days will be this Saturday, May 7, starting at 10 a.m.
More compost has been delivered by the City, so some of us will continue with the soil prep. 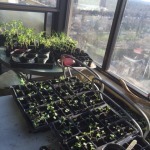 We will also begin planting seeds, starting with the “cold crops” which are not affected by frost. The forecast is for warm temperatures and sun, so don’t forget to bring bottles of water for everyone in the family and sunscreen, hats, etc. Many thanks to all of you who came out on Saturday, April 23rd. We had lots of volunteers, and much was accomplished. It felt good to get back into the garden again! This Saturday, April 30, from 10 a.m. until noon, we will continue where we left off with our soil prep. There are still garden beds to be weeded, and the soil needs to be turned over in the beds before planting. We’ll plant potatoes on Saturday, and we may also get to some of the other “cold crops” that are not vulnerable to frost. The work and sales shift days and times have now been posted. Weekly shifts will commence once the planting has been completed. We will keep you posted. Please click here for the shift schedule. 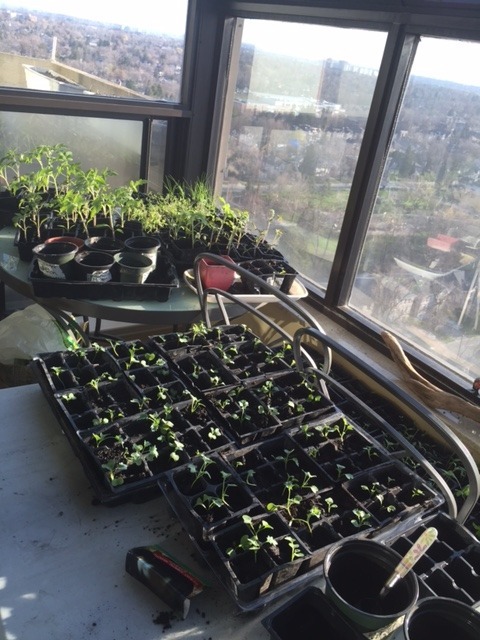 One of our volunteers has been growing seedlings in her solarium in preparation for our upcoming Planting days!